With Sundown Festival 2012 pulling all the stops to bring in leading acts from China, Japan, Korea, Hong Kong and Taiwan, the Marina Promenade is proving to be the place to be, rain or shine, on 1st December. Sundown Festival 2012 features buzzed-about newcomers and some of the region’s hottest solo and group acts including Jeno Liu Li Yang from China; Raymond Lam from Hong Kong; BTOB from Korea; Anthony Neely from Taiwan and Alice Nine from Japan. Tickets can be purchased via SISTIC: Online (Click here), Hotline (6348 5555) and at all SISTIC counters islandwide. Shout Out from the Artistes! “It was necessary to continue this tradition every year; it is our promise to our fans and supporters. Anyone who is interested in Asian music and proud of the immense talents the region has to offer should take a look at what is going to go down at Sundown Festival this 1st December,” said Samantha Chan, Director, Red Spade Entertainment. “Sundown Festival has a legacy of highlighting the diversity of the Asian music culture. At the same time, with fans from all walks of life and nationalities banding together to show support for their favourite Asian acts, it illustrates the boundless power music has to unite people and unify differences,” said Ellena Liu, Associate Director, Segment Marketing & Communications, Consumer Marketing, SingTel. This year’s Festival is being headlined by visual kei group Alice Nine, whose most recent releases included self-titled album“9” and compilation of music videos entitled ‘Alice in Pictures III’. Riding on the recent surge in popularity and demand for their brand of glam-metal rock and “visual style” of music outside of Japan, Alice Nine’s highly-anticipated appearance at Sundown Festival 2012 promises to be an evening of head-bopping entertainment. 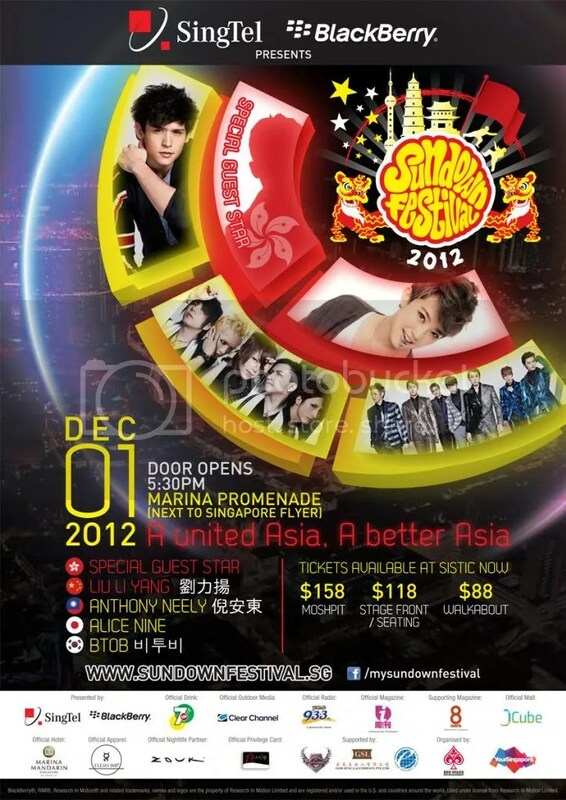 Do stay tuned to (x)clusive as we bring you updates on Sundown Festival 2012! Can updates Raymond Lam Flight Details? Will he also be appearing in Meet and Greet Session at JCube on 30 Nov 2012?